Rain or shine - bring something cozy to sit on and dress in layers, it can get cold. Venue is south of Touro University past the Army Reserve. Please follow the signs. 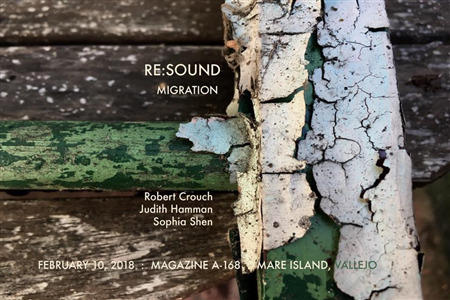 Re:sound is an experimental audio visual series which explores the relationship between forgotten spaces, the natural environment, and sound abstraction. The series takes place on the Mare Island Shoreline Heritage Preserve, a 215-acre park that formerly served as one of the first Naval Ammunition Depots. The performances take place in a decommissioned concrete munitions storage magazine measuring 55’ x 100. The architecture of the building traps sound resulting in a prolonged reverberation.